At a chain pizza place in Taiwan called 'Napoli Pizza,' there exists such a topping combination that is fried chicken and Kewpie mayo (the 洋食黃金脆雞披薩 Popcorn Chicken Pizza). While this isn't really that special for anyone who lives in Taiwan, since they regularly see things such as abalone and octopus gracing the tops of their pies, it surely was impressive to me, since I actually make it a goal of mine to see my doctor cringe. 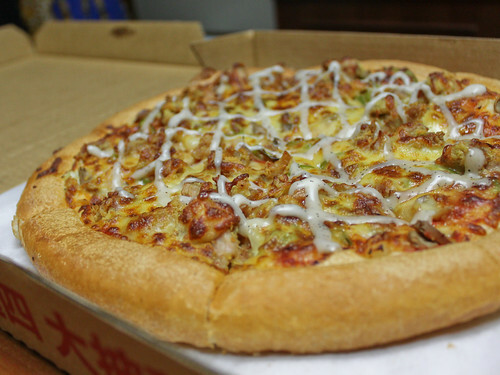 For 299 NT (~$9... although it's often on sale for 199 NT) you get a pan pizza similar in consistency and taste to Pizza Hut's, oily, thick, and rather bread like, which is then topped with their 'popcorn chicken' and a lattice of delicately drawn on mayo. How was this abomination of a pizza? Surprisingly good actually. Their popcorn chicken is actually nothing like what you'd get from Popeye's or KFC, but rather like chicken nugget pieces, which have an odd Japanese curry aftertaste (this was unexpected, but rather refreshing). Combined with onions, peppers, and 'black pepper' Kewpie mayo, you end up with a synergy of sweet, mild spiciness, and savory. No, it's true, this isn't a 'gourmet' offering by any means, but for ~$6-9, it's certainly edible, and definitely different than most pizza places would offer in the US. I would say it's worth trying at the very least, but then again, I'm no pizza snob. I'll eat pretty much anything with cheese, sauce, and crust. Sounds spectacular except for the Pizza Hut-like crust.